One of the most experienced internal medicine specialists at the Century Medical and Dental Center, Ciril Godec, MD, PhD, has more than 50 years of experience. 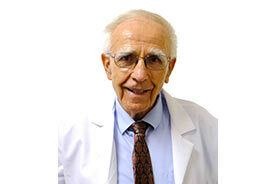 As a board-certified urologist, he is unsurpassed in knowledge and experience. Male-specific problems are common in Brooklyn and include erectile dysfunction, enlarged prostate, infertility, and testicular bladder syndrome. No matter what issue you’re experiencing, Dr. Godec can help you. Dr. Godec earned his Medical Degree (MD) from the University of Ljubljana. He finished his Ph.D. at Baylor University. He completed his internship and residency in the Department of Urology at the University of Ljubljana Medical Center. Now a US citizen, he’s worked at many hospitals and schools, including service as the Chairman of the Department of Urology at Long Island College Hospital. Dr. Godec is a member of a number of professional organizations, and he’s received many honors and awards for his outstanding service. Experience his compassion and skill. If you need a urologist, schedule your appointment today.